If you're a Maggie Smith fan then The Lady in the Van should not disappoint. 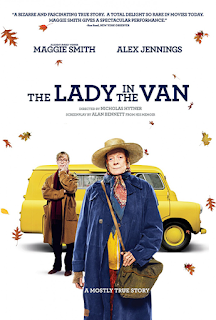 This 'mostly true' tale tells the story of the time real life writer, Alan Bennett (Alex Jennings), crossed paths with a transient, homeless van lady, Miss Shepherd (Maggie Smith), who eventually moved her van into his driveway for a number of years. Maggie Smith is charming playing the eccentric Miss Shepherd. Despite the characters cantankerous nature I never found her unlikable but I could imagine her daily imposition would certainly be very testing on many occasions. Alex Jennings carries the film well with the story being told from Alan Bennett's point of view. He's very believable as the kind of guy who has just enough inner strength to speak his mind when frustration gets the better of him but not enough ignore his empathy for Miss Shepherd's situation. The rest of the cast do a great job with minor but still relatively important roles that help define Miss Shepherd and Alan Bennett's within the broader community as well as tell Miss Shepherd's backstory. Aside from the character relationships the film does a great job of teasing Miss Shepherd's past right from the get go without revealing too much each time. I was never too caught up in wanting to know her backstory but it does add another layer to the film and was interesting each time you learnt a little more. It also helps to explain certain moments in the present adding a more weight and making them a little more poignant. In terms of comedy The Lady in the Van is occasionally laugh out loud funny but isn't particularly trying to be funny unless the laughs are organic to the story. I found it had a good balance between humorous, thoughtful and reflective moments without ever becoming a particularly sad story. My only real criticism is that I felt the movie was a little slow in places, but never for long enough to feel like it was dragging (keep in mind I usually prefer watching sci-fi and superhero movies). Overall, a very enjoyable film with two really strong characters that make for an engaging story. Even if you're not familiar with Maggie Smith you'll still enjoy this well told tale. I hope to go and see this before it disappears. I've seen the trailer on the 'net. The man playing Alan Bennett does a good job, as he sounds just like him with the accent. Went to see this last Weds 6th April. It was an enjoyable film but I think I'll comment on it on our Family Message board incase I might reveal too much.